Sponges fight with corals for spaces to live on the reef. This blue Star Coral has been invaded by an Orange Icing Sponge. Sponges try to kill corals to make spaces for themselves on the reef. Often algae grow on the dead surfaces between the sponges and the healthy corals. Sponges are colonies of thousands of microscopic animals. The colony works together, pumping water through the body of the colony. The tall clear "chimney" is an exhaust tube, where the water pumped by the sponge comes out. The animals of the sponge eat the plankton that they filter out of the water as the water is pumped through the body of the sponge colony. 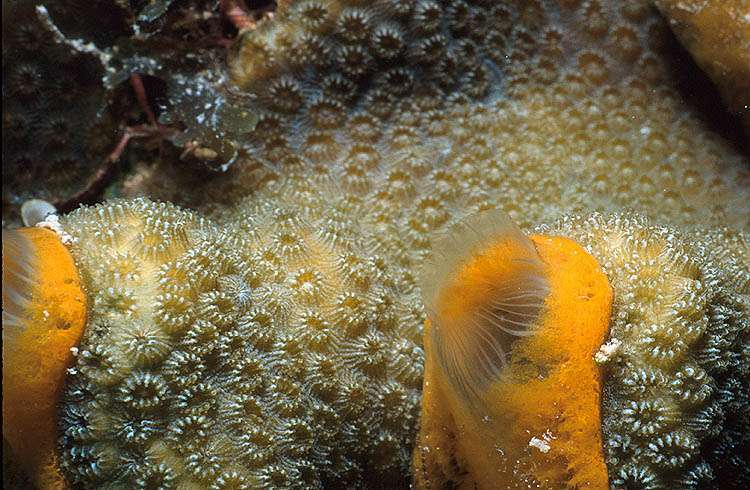 Animals that eat sponges help keep a healthy balance between sponges and corals. These animals help prevent the sponges from taking over the reef. Sea Turtles are important sponge eaters. This scene in this picture was about 3 inches wide.